This article is about the 1972 film. For other uses, see Silent Running (disambiguation). Silent Running is a 1972 environmental-themed American post-apocalyptic science fiction film. It is the directorial debut of Douglas Trumbull, and stars Bruce Dern, Cliff Potts, Ron Rifkin and Jesse Vint. It is implied that, in the future, all plant life on Earth has become extinct. As many specimens as possible have been preserved in a series of enormous, greenhouse-like geodesic domes, attached to a large spaceship named "Valley Forge", forming part of a fleet of American Airlines space freighters, currently just outside the orbit of Saturn. Freeman Lowell, one of four crewmen aboard, is the resident botanist and ecologist who carefully preserves a variety of plants for their eventual return to Earth and the reforestation of the planet. Lowell spends most of his time in the domes, both cultivating the crops and attending to the animal life. The crew receives orders to jettison and destroy the domes (with nuclear charges) and return the freighters to commercial service. After four of the six domes are jettisoned and blown up Lowell rebels and opts instead to save the plants and animals on his ship. Lowell kills one of his crew-mates who arrives to plant explosives in his favorite dome, and his right leg is seriously injured in the process. He then jettisons and triggers the destruction of one of the remaining domes, trapping and killing the remaining two crewmen. Enlisting the aid of the ship's three "drones" (service robots), Huey, Dewey and Louie (named after Donald Duck's nephews), Lowell stages a fake premature explosion as a ruse and sends the Valley Forge careening towards Saturn in an attempt to hijack the ship and flee with the last forest dome. He then reprograms the drones to perform surgery on his leg and sets the Valley Forge on a risky course through Saturn's rings. Later, as the ship endures the rough passage, Drone 3 (Louie) is lost, but the ship and its remaining dome emerge relatively undamaged on the other side of the rings. Lowell and the surviving drones, Huey and Dewey, set out into deep space to maintain the forest. Lowell reprograms Huey and Dewey to plant trees and play poker. Lowell begins speaking to them constantly, as if they are children. Huey is damaged when Lowell accidentally collides with him while driving a buggy recklessly, and Dewey sentimentally refuses to leave Huey's side during the repairs. As time passes, Lowell is horrified when he discovers that his bio-dome is dying, but is unable to come up with a solution to the problem. When the Berkshire – another space freighter waiting to see if the Valley Forge has survived the trip – eventually re-establishes contact, he knows that his crimes will soon be discovered. It is then that he realizes a lack of light has restricted plant growth, and he races to install lamps to correct this situation. In an effort to save the last forest before the Berkshire arrives, Lowell jettisons the dome to safety. He then detonates nuclear charges, destroying the Valley Forge, the damaged Huey and himself in the process. The final scene is of the now well-lit forest greenhouse drifting into deep space, with Dewey tenderly caring for it, holding a battered old watering can. With its cover-plate removed during a shooting break, double-amputee actor Mark Persons is visible inside the tiny Drone 1 (Dewey) costume. Trumbull had been involved with creating effects for 2001: A Space Odyssey. Director Stanley Kubrick had wanted the Stargate sequence of that film to be about Saturn, but there were technical difficulties in getting the special effects for it finished in the limited time available. The Saturn idea was scrapped, and Kubrick substituted Jupiter instead. Trumbull developed the sequence after production, and it was recreated for Saturn in Silent Running. The interiors were filmed aboard the decommissioned Korean War aircraft carrier USS Valley Forge (LPH-8), which was docked at the Long Beach Naval Shipyard in Long Beach, California. Shortly after filming was completed, the carrier was scrapped. The forest environments were originally intended to be filmed in the Mitchell Park Domes in Milwaukee, Wisconsin, but the production budget forced the sequences to be shot in a newly completed aircraft hangar in Van Nuys, California. Trumbull stated in the commentary accompanying the DVD release that the geodesic domes containing the last forests of Earth's future on the Valley Forge were based on the Missouri Botanical Garden Climatron dome. Three freighters are shown in the film: the Valley Forge, the Berkshire, and the Sequoia. Five other ships that carried domes – the Yellowstone, Acadia, Blue Ridge, Glacier and Mojave — are also mentioned. Each ship features a designation on the hull which notes the area from which some of the flora and fauna samples were taken. The Valley Forge is listed as "Bahia Honda Subtropical", indicating at least some specimens were taken from this area of the Florida Keys. The model of the Valley Forge was 25 feet (7.6 m) long, and took six months to build from a combination of custom castings and the contents of approximately 800 prefabricated model aircraft or tank kits. After filming was completed, American Airlines expressed an interest in sending the model on the tour circuit, but this was not feasible due to the fragile nature of the model (in fact, during filming pieces of the model kept falling off). The ship was subsequently disassembled after several years sitting in Douglas Trumbull's personal storage facility. Several pieces, including the domes, wound up in the hands of collectors. Several domes survive, including one that now rests in the Science Fiction Museum and Hall of Fame in Seattle, Washington, and another which was sold at auction in 2008. The three drones were played by four bilateral amputees, an idea inspired by Johnny Eck, a sideshow performer of the early 20th century who had been born without lower limbs. The 20-pound (9.1 kg) drone suits were custom-tailored for the different actors. The suits are in Douglas Trumbull's personal collection. The sound effects, including the drones, were created by uncredited composer Joseph Byrd. They were generated on a modified ARP 2600 synthesizer with added Oberheim Expander Modules. The soundtrack was written by bassoonist and P. D. Q. Bach creator Peter Schickele. It contains two songs written by Schickele and Diane Lampert — "Silent Running" and "Rejoice in the Sun" — which were performed by popular folk singer-songwriter Joan Baez. The two songs were issued as a single on Decca (32890). In addition, an LP was released on Decca in 1972 (DL 7-9188) and later reissued by Varese Sarabande on black (STV-81072) and green (VC-81072) vinyl. In 1998, a limited-release CD by the "Valley Forge Record Groupe" included an additional track with the spoken introduction "God Bless These Gardens". A CD with audio restoration was released in 2016 by Intrada, Special Collection Volume 369. 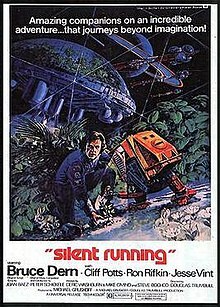 67% of 27 critics on Rotten Tomatoes gave good reviews to Silent Running. Praise is mainly focused on the special effects and Bruce Dern's performance, while the script and storyline are criticised as weak. In his New York Times review, Vincent Canby said that Silent Running "is no jerry-built science fiction film, but it's a little too simple-minded to be consistently entertaining". Carl Sagan in the newspaper criticized the "technically proficient" film for depicting a future in which people have forgotten the inverse-square law, and that plants need sunlight. Roger Ebert gave the film his highest rating of four stars and praised Dern as "a very good, subtle actor." Gene Siskel gave the film two stars out of four and compared it unfavorably to 2001: A Space Odyssey, saying it had "the same effects but none of the wit or intelligence." Arthur D. Murphy of Variety lauded the "excellent special effects" and "broadly entertaining script" but faulted the "crucial miscasting" of Dern, explaining, "Walking around often in robes which crudely suggest some kind of airborne vegetarian Noah, and otherwise suggesting an out-to-lunch mentality, his characterization does not evoke empathy." Charles Champlin of the Los Angeles Times praised the film for avoiding "the usual heavy hokum associated with the [sci-fi] genre" and called it "a solid and well-disciplined first film. The spaceries really are impressive and the movie is an ingenious family entertainment which offers something to think about." Gary Arnold of The Washington Post called it "the most original and interesting science-fiction melodrama since 'Planet of the Apes' and a new classic of the genre." Penelope Gilliatt of The New Yorker wrote, "The robots have endearing qualities, paddling about as if in galoshes, and they play a wonderful game of poker, but this is sci-fi with the soul of an editorial." UK film critic Mark Kermode said the film was a personal favourite and that he preferred it to 2001. A novelization of the film was published by Scholastic Books in 1972. It was written by Harlan Thompson, a long-time children's book author, based on the screen story and screenplay by Cimino, Washburn, and Bochco. ^ a b Canby, Vincent (April 1, 1972). "Silent Running: Science-Fiction Story With Cheerful Robots". The New York Times. Retrieved 2009-08-05. ^ "Johnny Eck - The Half-Man Circus Freaks and Human Oddities". The Human Marvels. August 7, 2006. ^ Ravas, Tammy (2004). Peter Schickele: a bio-bibliography. Greenwood Publishing Group. p. 7. ISBN 0-313-32070-5. ^ Nash, Jay Robert; Ross, Stanley Ralph; Connelly, Robert (1897). Nash, Jay Robert; Ross, Stanley Ralph, eds. The motion picture guide. 7. Cinebooks. p. 2920. ISBN 0-933997-00-0. ^ "Silent Running (1971)". Flixster Rotten Tomatoes. Retrieved July 26, 2011. ^ Ebert, Roger. "Silent Running". RogerEbert.com. Retrieved December 10, 2018. ^ Siskel, Gene (May 8, 1972). "Silent Running". Chicago Tribune. Section 2, p. 19. ^ Murphy, Arthur D. (March 8, 1972). "Film Reviews: Silent Running". Variety. 24. ^ Champlin, Charles (March 10, 1972). "Man Alone in 'Silent Running'". Los Angeles Times. Part IV, p. 1. ^ Arnold, Gary (May 1, 1972). "A Moving Elegy-in-Advance". The Washington Post. B1. ^ Gilliatt, Penelope (April 15, 1972). "The Current Cinema". The New Yorker. 125. ^ "Mark Kermode's film blog: Silent Running". BBC. 1 November 2011. Retrieved 22 October 2014. ^ "Publication: Silent Running". isfdb.org. Al von Ruff. Retrieved 2017-05-24. Wikimedia Commons has media related to Silent Running.